Finally, after all the hype and build up surrounding DC Comic’s bold initiative to effectively re-boot their entire line Wonder Woman fans finally got to see what this would mean for their beloved Amazon. Following the “pants-gate” debacle people began to refocus once more on what creative and editorial direction the re-launched book would take and how would Diana’s character be changed – if at all. The new creative team of Brian Azzarello and Cliff Chiang had purposely kept a low profile during the run up to the launch and gave only a few brief interviews. 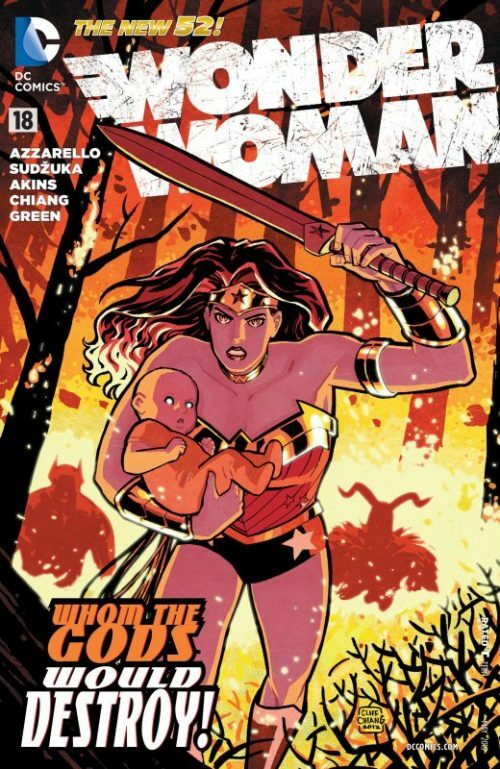 Much furore occurred however after Azzarello made a casual comment that “Wonder Woman” would be less of a superhero book and more a horror book! Visions of Diana becoming DC’s version of “Vampirella” caused some trepidation on the fan forums to say the least, but later both Azzarello and Chiang clarified that the “horror” reference was more to do with the sort of horrific situations Diana would be facing. They stated that the Greek mythology that played such a major part of Wonder Woman had always contained bloodthirsty Gods and Monsters which would be reflected in the new book. These pronouncements however did not necessarily placate all sections of the fan base, with the implication that we might be seeing more of the amped up violence and bloodshed that had beset the ‘Odyssey’ story arc. And with publicity art showing a weapon wielding blood covered Diana, there was understandably still some nervousness as to what to expect when opening the first issue. 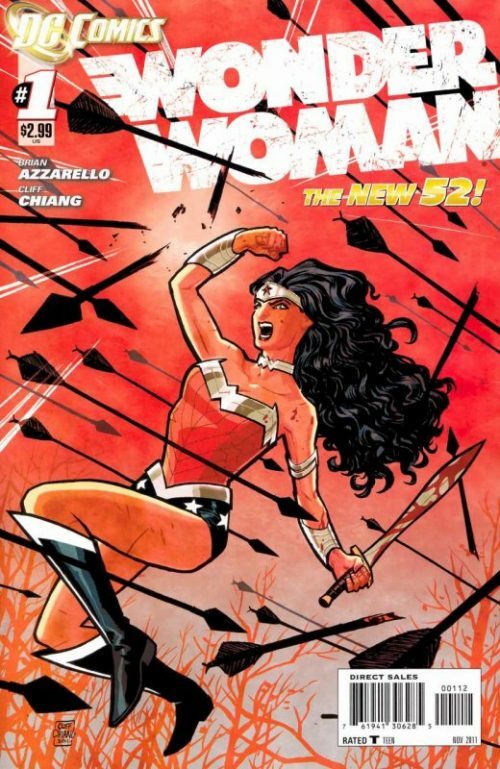 Even Dan Didio himself clearly understood the stakes and went on record to state that while initial sales of the first batch of #1’s launched as part of DC’s “New 52” initiative had sold very well, he was still nervous about fan reaction to titles such as “Wonder Woman” who, quote “has one of the most ardent fan bases around”. With such high expectations surrounding the title then, it was little wonder that it had a lot to prove! When at last the first issue was published it was an instant big seller, generally meeting with wide spread praise from both industry critics and fans alike – with many indicating that it was one of the best books of the entire “New 52” relaunch. On first indications there was relief that fans seemed to have the Diana back they all knew and loved – acting as we would expect her to act after the misguided direction taken in ‘Odyssey’ and the story set up, involving scheming Gods and mythical monsters, seemed very much in keeping with the character’s history and past. 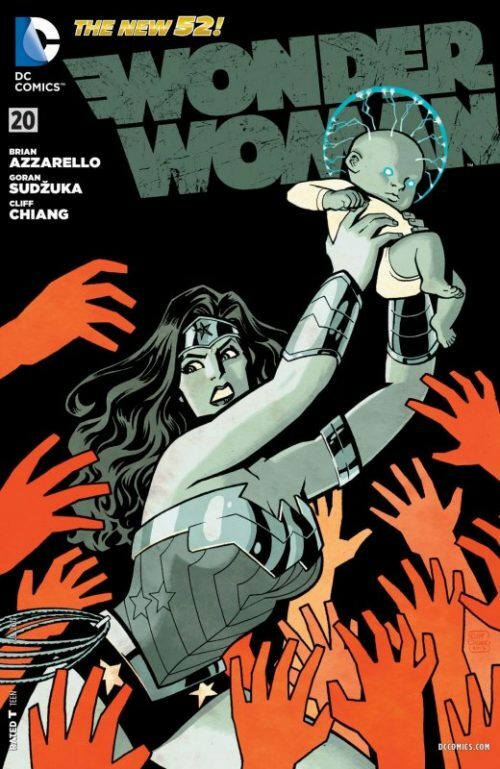 Many new readers, who had dropped the book or had simply never been inclined to read “Wonder Woman”, picked up the book, intrigued by what Azzarello’s take on Diana would be after so much speculation. That said, after the first couple of days euphoria had died down there were some indications that the issue was not quite a unanimous success. 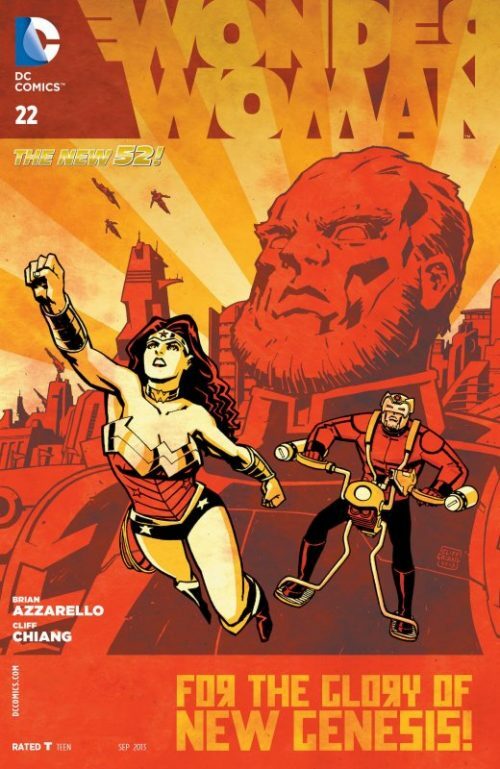 Some wondered whether the gushing reception received by the book was perhaps more indicative of just how bad a story ‘Odyssey’ had been – more than how good this new Wonder Woman actually was – and that anything would have been perceived as a vast improvement! 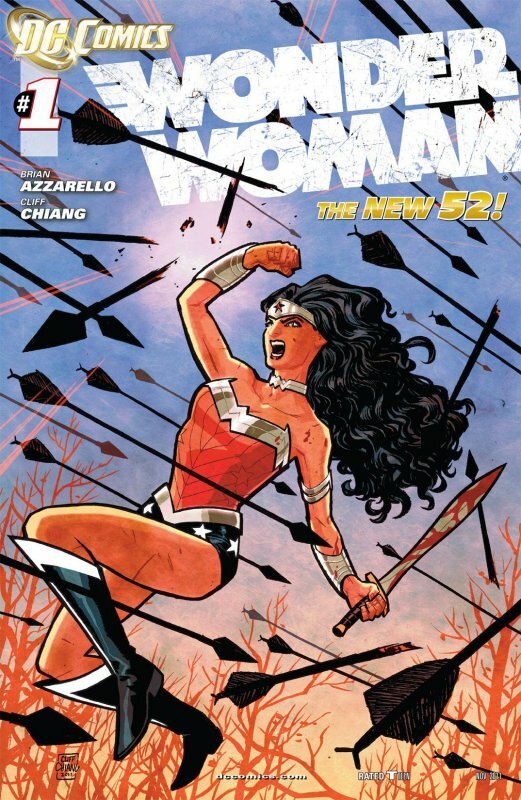 Concern was expressed in some quarters that this Diana seemed to have been de-powered to a certain extent and that – as had been suggested based on Azzarello’s track record – the book would have more of an adult feel to it, resembling a “”Vertigo” version of Wonder Woman than the more traditional approach taken by previous writers. 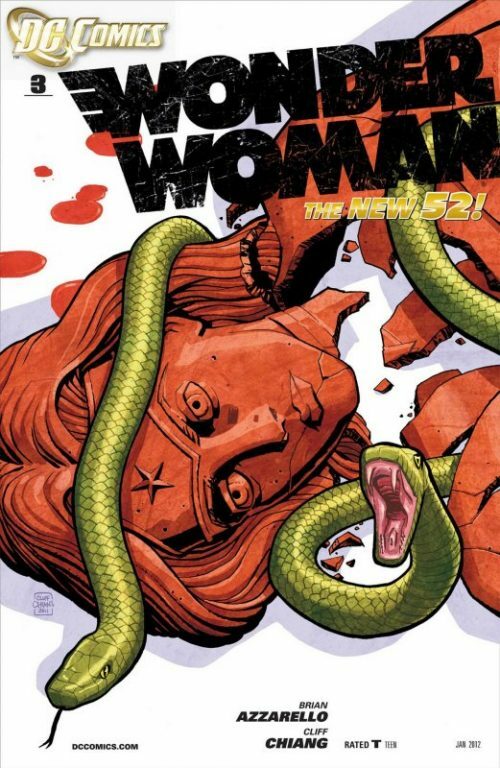 As had become a theme amongst many of the “New 52” titles launched by DC, the blood and gore quota was higher than one would expect in a typical Wonder Woman book. And while Diana has always been depicted as a warrior at heart, a few felt that the character strayed a little too much towards “Xena – Warrior Princess”. While the majority of people seemed to praise Cliff Chiang’s artwork, there were a small few who found his style rather too cartoony and sketchy and not to their liking. Chiang’s Diana was attractive to look at certainly – although she was still saddled with the choker, armband and of course those new blue boots, which to some fans still seemed awkward, spoiling her overall design look. It was clear from this first issue that Azzarello had a very firm vision for his interpretation of Diana and the world she would exist in. With this initial issue he managed to set up his first major story arc well, depicting very modern Olympic Gods and sprinkling enough intrigue to whet the reader’s appetite – and at the same time reminding us what Diana can do when called to action. Arguably however, it was quite a dense narrative and required a number of readings in order to grasp exactly what was going on. 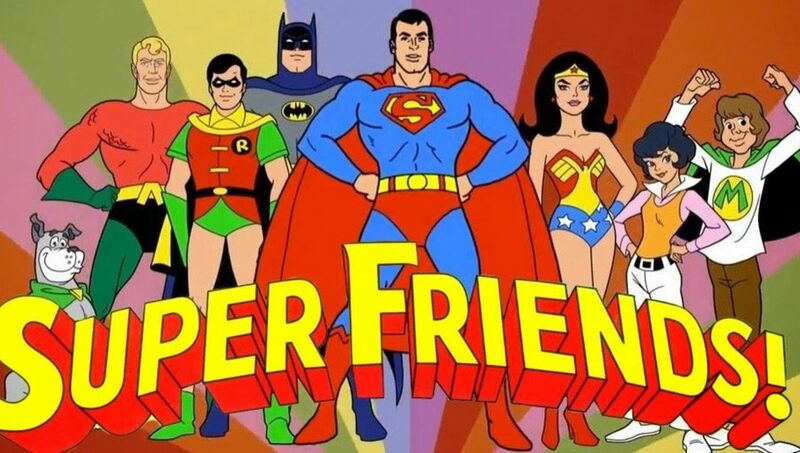 Also, to some extent – while one of the main purposes of the DC relaunch was to attract new readers without having to worry about the perceived “baggage” of history and canon – this did not necessarily seem quite as easy a read for a brand new reader unfamiliar with Wonder Woman as it should have been – although it was still early days in the arc and there would of course be more opportunity to put some of Diana’s world into further perspective. Interestingly, Azzarello chose not to let us know Diana’s every thought – allowing the reader to decide on her thought processes instead of the character explaining her motives in each panel. Impressed by her insightfulness, he tells them that he knew from the very first moment he had laid eyes on them that they would be perfect choices. He continues to explain that his father “gets around” and angers his betrayed wife. One of the other girls picks up on the fact that Apollo says “his wife” instead of “my mother” and again, an impressed Apollo nods and says that as he had previously stated, his father “gets around”. And now he needs to find his father as he is currently missing. Not far away in the farm house Hermes is trying to warn an unsuspecting young girl named Zola to get out of the house as quickly as possible. She however warns the strange intruder to get out of her house while training a shotgun on him. He again urges her to trust him as assassins are on their way to kill her and her child. Still unconvinced, she opens the front door, gesturing him again to exit. Suddenly he sees something outside and pushes her out of the way just as an arrow flies through the open doorway, striking him instead! A stunned and terrified Zola sees Hermes is impaled on the far wall, but has little time to react before the two freshly formed Centaurs crash through into the house, weapons raised. Just as they are about to strike the fear paralyzed girl, Hermes throws her a glowing key and as she instinctively catches it in her hand she disappears in a flash of light, narrowly avoiding the strike of a Centaur’s blade. A dazed Zola suddenly finds herself in a London apartment at night. She sees Diana lying asleep on the bed. She reaches out her hand to wake the Amazon but is swiftly grabbed by the throat as Diana instinctively reacts to the intruder. She demands to know who Zola is and what does she want? The girl stammers that there had been monsters that were going to kill her and asks if Diana is about to as well? Seeing that the young girl is no threat and clearly scared, the Amazon Princess gently puts her down and assures her that she has no intention of killing her. As Diana gets out of bed and wraps a sheet around her naked body she enquires how the girl had managed to get here? Zola explains that a strange man had handed her a key. As soon as Zola shows Diana the key, the Amazon realises its significance and asks the girl to hand it to her. A reluctant girl clutches it to her chest and says “No!” and in an attempt to reassure the still nervous Zola, she asks the girl’s name as she walks over to her closet. After being told “Zola” by the girl, the Amazon Princess reciprocates and says that her name is “Diana”. As she opens the closet she reveals Amazon weaponry and armour stored inside. She begins to put on her costume and the distracted girl, looking the other way, continues to explain that she is afraid. Diana replies that she probably should be too and suddenly the girl turns round to see Wonder Woman standing there! She realises just exactly who she has been talking to for the past few minutes. “You’re Wonder Woman!” cries an astonished Zola. “Diana” corrects the Amazon Princess. Once again she asks for the key and holds out her hand. But instead, the girl clasps her outstretched hand with her own and in a flash of light they are both transported back to the farmhouse. Wonder Woman chides herself for being stupid in letting that happen and quickly assesses the situation. She hears a cry from inside the house and warns Zola to stay close to her. Suddenly several arrows fire through the open doorway towards them and Wonder Woman instantly puts herself in between them and the girl, using her bracelets to deflect them. The force of their impact however knocks her to the floor momentarily and as the two Centaurs charge out of the house towards them, swords raised, Zola panics and runs towards the nearby woods. 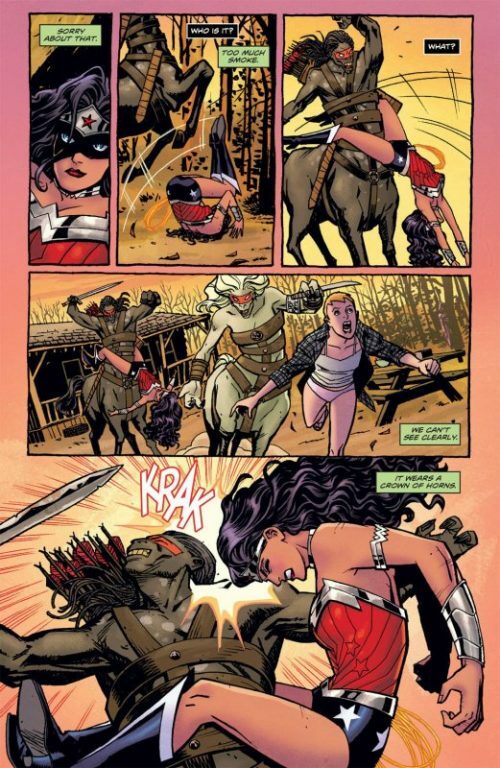 As one of the Centaurs pursues her the other tries to trample Wonder Woman but she manages to dodge the deadly hooves before using her momentum to launch herself up legs first, grabbing the Centaurs neck in a scissor movement, before head butting him with her tiara. The stunned Centaur lets go of his sword which Wonder Woman deftly catches – before dismounting again and hurling the sword at the other Centaur, who has managed to grab Zola. The perfectly aimed sword slices off the arm of the Centaur, freeing Zola. Simultaneously, while these events are taking place, the three Oracles in Singapore are telling Apollo of their prophetic visions. As he asks what they can see they reply as one that there is a gathering storm and that the one responsible will rule in fire. Apollo asks who it is but they reply that there is too much smoke to see clearly, although they can see that the individual wears a crown of thorns and a cape of blood, flowing from its shoulders onto a naked woman at its feet. The Sun God asks about the feet and is told that they are bare, like that of a woman. He realises that it must be a family member – one of the Pantheon. They add however that his family will be beaten, broken and betrayed by blood. They continue that his father has abandoned fate to someone who can blow the smoke away if they choose to. What his father Zeus wants however is nothing anyone should. It is dirty and irredeemable. And it will not end good for Apollo. One of Zeus’ own children will murder another of his children and take their place. And Zeus wants it to happen. Apollo, almost unsurprised that his father could scheme such a cruel thing, sees the sun rising on the horizon and asks one final question.